Hello. It's Lisa today with a shadow box project. I found this lovely gem by Selma Stevenson on the Scor-Pal site and was inspired to try my hand at one. Of course, while I'm at it, I thought I'd show you how easy it is to replicate the project too! STEP 1: Trim 2 x 5.5" squares from Straw cardstock. Score along both sides as outlined below in the template, using your Scor-Pal and Scor-Tool. 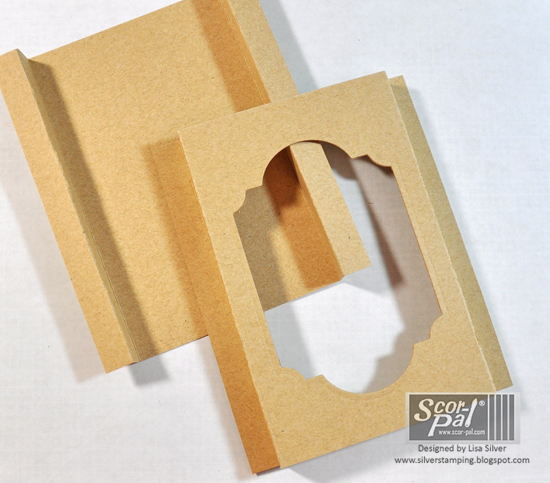 STEP 2: Select a die and cut a window into one of the scored pieces of paper. It's easiest to cut the window with the score marks in place, as you can visualize where the window should be placed. Use repositionable tape (painter's tape is a favorite of mine) to hold your die in place. Do this step before folding along the score lines so it will fit in your die cutting machine and be less likely to shift. 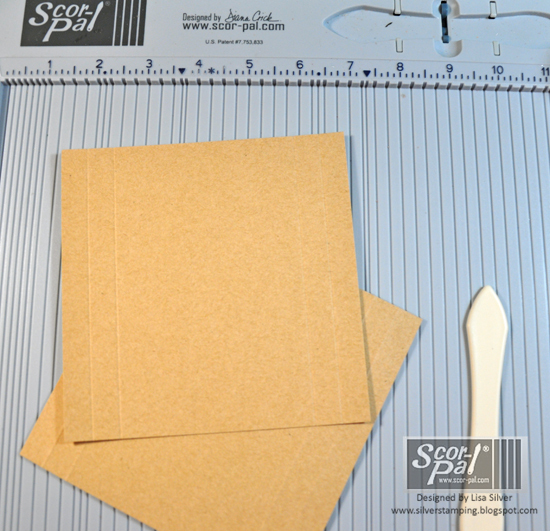 STEP 3: Fold along the score lines using your Scor-Tool to create your shadow box base. 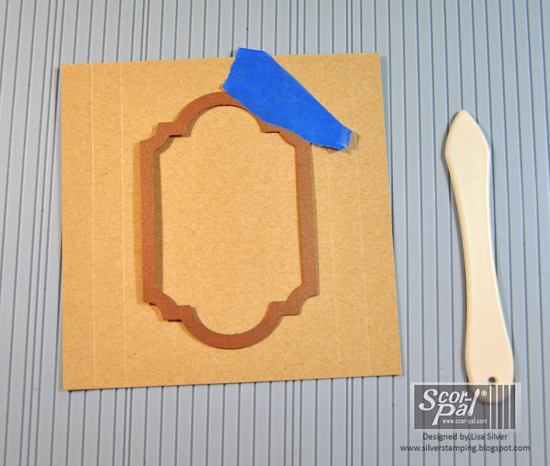 STEP 4: Using the base of the card as your guide, trim a piece of cream cardstock to 3.25" x 5.25". Stamp an image on the piece. 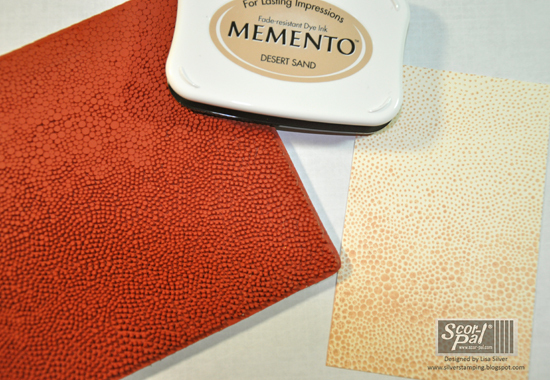 Dry embossing or a tone-on-tone die cuts would also be lovely. STEP 5: Die cut images to embellish your card. The flower image was die cut from cream cardstock and various Distress Stains were used to color. To make it easier to add color to the delicate die cut, leave the flower in place on the original piece of cardstock and add ink to color. 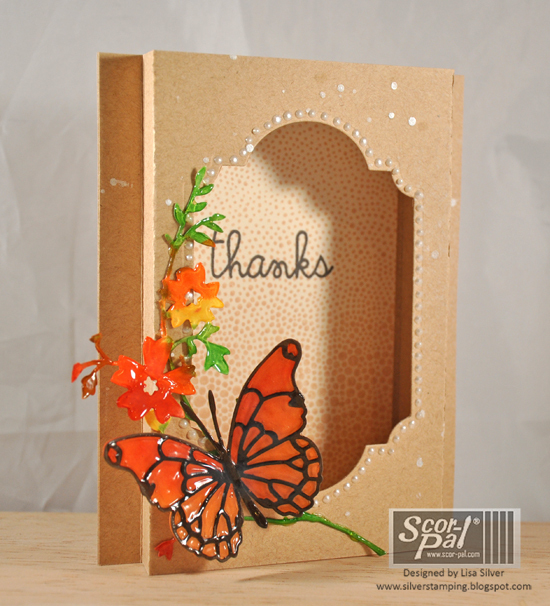 The butterfly base was die cut from orange cardstock. To give the butterfly an ombre effect, I used Distress stains and a bit of water to blend. 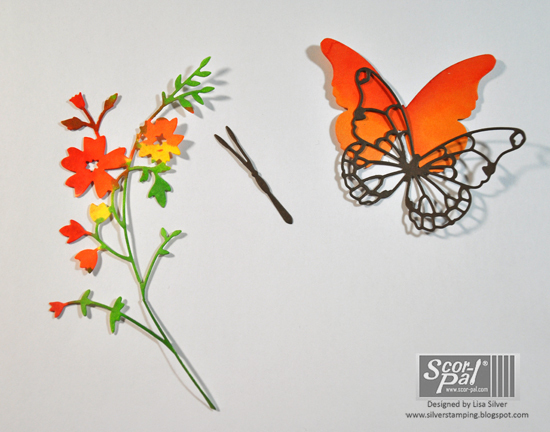 Glass Effects were added over the entire floral image and the die-cut butterfly. The edges will curl a bit, but it helps protect the delicate edges of the flower. Other options are creating felt or paper flowers, stamped images or stickers. STEP 6: Complete your card. Stamp a sentiment to the background of your card. Use the window front of the card to determine the best placement. Adhere the top of the card base to the bottom with Scor-tape. Add the embellishment die cuts. Add sprays and dots of pearl pen to complete your card. Love this card and the idea. Thanks for giving instruction. Your shadow box is gorgeous. Love the bright colors. I love creating shadow boxes. What a lovely card,I love butterfly'S. soooo pretty Lisa - I love all the little details! Nice work!